There was a RadioLab (NPR show) that talked about what actually has been observed to happen inside a cocoon. (The Link to that RadioLab show is provided in the description of this YouTube video I made). The gist of the show describes the science re: the way the caterpillar body completely disappears – turns into “goo” but apparently still carries certain programming it established while a caterpillar into it’s new butterfly body. This is so interesting compared to what Ti and Do taught about a human body being able to also go through a metamorphosis. They even talk about a “reverse metamorphosis” that DO once mentioned as what Adam experienced when he broke instructions and “fell” that enabled his Next Level grown (made) body to revert to mammal behaviors to reproduce like a mammal. DO said that reverse didn’t take very long to transpire. TI and DO also said Jesus completed his “changeover” (metamorphosis) in the event told as the “Transfiguration” when he and 3 of his students were visited by Two Beings who spoke to him about laying down his vehicles life at that time to complete the task he was sent to do. In other words, the task was to voluntarily die their human vehicle according to instructions from the Older Member provided directly and having completed that “overcoming” (christing, christening) process enabled the new body literally growing inside the old body to heal the old body that died. I believe Ti said that it’s a characteristic of a Next Level member to be able to heal their body in 3 1/2 days. I guess the new body grown from it’s “deposit” has that capacity, perhaps kin to the way certain creatures can regrow body parts they lose for whatever reason. The Next Level gives us all these examples that can serve as clues to broaden our understanding and thus gain “faith” that is actually defined as “evidence of things unseen” as DO had me read from scripture on one of the sessions I was a helper on in the “Beyond Human – The Last Call” video series. -Irma and Juan all part of Jesus forcast of “sea and waves roaring” during this 4th Seal Harvest (pulling up of Tares) time. Symptoms and Side Effects of Opening You Third Eye Chakra – What will happen After Third Eye Awakening and what are the signs of an open third eye? The third eye chakra, or Ajna Chakra in Sanskrit, is our connection to our spirituality and is located between your eyebrows. Third eye meditation can helps you open and activate this chakra. But before you start your third eye awakening, you should take some time to learn more about this chakra and what you can expect from opening it and what you need to be aware of. So here are a couple of things many people have reported experiencing after opening their third eye, and the signs you can look for is you have already opened your third eye, both good and bad. Many people have experienced hearing a loud popping sound from inside the middle of their head when they first open their third eye chakra. This is believed to be the opening and activation of the pineal gland. The pineal gland is a small hormone-producing gland that is connected to the third eye and is what regulates our sleep rhythm and releases melatonin. A very normal side effect of opening the third eye is an intense pressure on your forehead and you may feel a consistent tingling or vibrating sensation on the third eye that can stay for days after opening the third eye chakra. This is only a sign that the meditation has worked and your third eye is awakening. This will go away within days, so don’t worry. People often times experience symptoms directed to their vision and they begin seeing unexplainable things not from this world. This is what you need to be prepared for, as it will be a frightening experience if you are not properly informed and did not prepare yourself for this. One of the things you may see are paranormal entities or what we call spirits of those who have passed. You can develop clairvoyance and the ability to communicate with spirits. Some people see other beings not of this world, and could be creatures of other dimensions or what religion might refer to as demons. No matter what type of entity you may encounter, it will be a very overwhelming experience, and for some people it starts to feel like insanity and something they have a difficult time shutting out. This is why opening the third eye is something you should prepare yourself for, so that you know what you are dealing with and what you can expect. This means that you have to be patient and take some time learning about the third eye before you actually try opening it… it will greatly benefit you in the end. So to some of the more positive sides of opening the third eye is your increased ability to develop your psychic abilities and many people have reported experiencing astral travel, seeing auras and a greatly improved intuition. Other symptoms of an open third eye chakra is more subtle. You will for instance improve your awareness and notice more things around you that were only background elements to you before. You step out of the state of autopilot, where you just go through your day not noticing or paying attention to anything. Some describe a state of objectiveness where you are not blinded by your eyesight and the illusions and lies your eyes fall a victim to, but you will be able to see things more clearly and sense the truth and reality that is difficult to put into words. This could be a sign that your intuition or sixth sense is improving. A lot of people say they see lights or colors while meditating, and this is just a sign that your chakra is activating. At some point they may even start to see pictures in their minds eye when they meditate, which in the beginning are very unclear and like a blurry image. Over time with third eye practice, the images will become clearer. Some will see an eye with the indigo or purple color of the third eye chakra in their minds eye. If there is any technical advise to avoid any dark entities scary stuff? thanyou for your advise. There are no entities that are not scary who will be attracted to you by continuing playing with these tricks. The lower forces of the planet love to have “vehicles” they can work through. These include space aliens that are actually no longer “space” aliens because they can no longer travel very far from earth – the reason they are trying to get humans to do so, because they wish to escape the earth where they have been in prison for thousands of earth years. Several years ago, I believe I was given a sample of a third eye opening, I suspect to show me what people were doing and seeing and experiencing as a result. After a few weeks of seeing things it was removed. This third eye opening is a fake enlightenment. What someone is doing with this meditation might be compared to adding a device to your “brain” (computer) that provides a more powerful interface with whatever spirits and actually space aliens that want to use your vehicle. Sure they can assist you in many human things but true enlightenment means you have risen above the human evolutionary kingdom. I don’t think there are any truely enlightened being on the planet right now. I say that because I was the student of TWO enlightened beings, who incarnated into the body of a human woman and a human man in the 1970’s who took the names Ti and Do. They proved to me over 19 years with them that they were from the One True/Real Many Membered Physical Evolutionary Level Above Human – the organization of Beings who have evolved by choice above the human evolutionary condition. They don’t circulate on earth any more than a human would be comfortable living in a wild dog pack or worse yet a snake pit. We can’t actually rise to their state of enlightening without them because what that means is actually filling a “deposit container/pocket” (soul) they install in certain human vehicles, with Their Mind, (spirit) which is living information that if adhered to can grow within that deposit and eventually can be harvested from our vehicle, usually when it dies IF we qualify as they don’t need us and they don’t want just anyone to fill space on their spacecrafts where they live and work, so they make it very hard to join their ranks, but not so hard that anyone who keeps seeking their help can’t accomplish it. Each person who wants to verify that I am telling the truth about this can project their asking beyond the nearest stars to Them – especially in the names Ti and Do. It’s your choice but to chose these other entites that are space aliens and/or discarnate human spirits is a dead end for your soul. They love having souls as they don’t know how to make a soul and nor can they kill a soul. Only the Next Level who designed everyting and all the life forms can make or destroy a soul. This is one of a number of ways the Luciferian space alien (fallen angels) capture souls that have been planted into humans becaue of the lure of power one gets to see things others don’t see and to have an advantage in the receipt of future help with the intention to capture others. They also want the DNA from those they capture as then they can propogate hybrids they and your soul can prepare for when each physical body being used now dies. They can have you believe when you die you will then be “free” and have that be a welcomed condition theoretically – not encumbered by physicality but it’s an illusion of freedom as once discarnate one can not FEEL sensations in the same way so there is a “wanting” that can not be satiated but they get some satisfaction by influencing living humans to be their tools. This is the norm for the entire human society. All our vehicles are time shared computer systems. The only part that is “us” is the “decider” of what to think, and do. Now that it’s nearing recycle time it’s especially crutial to those that can still make some sense out of what I’m saying as there is yet another even higher level we need our physical body to make application for and has to be done entirely by choice that involves many steps to progress to and they must be the steps received from an Older Member of the Evolutionary Kingdom Level Above Human that they provided when they came incarnate as they have done a number of times since the start of their latest “garden” like experiment designed to grow souls into new members of their Kingdom. All these things taught by the Luciferian space aliens is permitted by the Next Level Older Members because it serves to provide us with a total choice of what to become in their “garden”. We can become as rotten as the Luciferians chose to become, that they don’t think they are and even have many disbelieving they even exist. The Next Level will recycle those and it’s very soon without a middle aged person’s human lifetime that that will be completed which will include dissolving the “spirit world” and leveling and spading the entire planet, what some are mis-thinking will “heaven” on earth while it will be a time period to where the planet will have a rest and restoration of the harm the Luciferian space aliens and human sheeple have caused on it, mostly in destroying having any chance to choose to recognized these Creator Beings. Ti is the Chief Administrator of this garden. She, though is not a gendered being, took a female vehicle with Do and fulfilled the Revelations Two Witnesses prophecy and all the prophecies, though some have yet to play out. She was the One who planted a deposit soul into the vehicle they made (not by human mammalian reproduction) to start the recent experiment. Do was serving by taking over the Adam vehicle and he fell to the influence of the Luciferian space aliens who were allowed to be present to set up the testing criteria. That same soul last known as Do (and to date) recovered over 7 generations later and took over the vehicle named Enoch who then came incarnate as Moses and then Jesus and possibly guatama Buddha and who knows who in previous civilizations on Earth and/or on another planet. This is NOT christian talk nor spiritual. It’s the real deal – the only real deal on earth and in the heavens – literally outer space. There is a great deal to say about all this but it’s up to you to seek it out. I’m simply providing an avenue but I am not a “teacher” from the Next Level. I am a student of Ti and Do, so I have zero desire for followers of me or to start an organization or new religion as religions at this time are all killers of souls because of how they draw people to become satisfied with the human condition and even satisfied to die thinking they get some “heaven” without the huge investment needed of showing the Next Level we want to serve Them on Their Crews on board spacecrafts large and small all over the universe. You can contact Ti and Do by projecting your asking beyond the stars to them or if that’s too strange to use their names to the highest Living Being you can imagine exists and if you are sincere they will show you that I speak Their truth. They never lure or manipulate anyone though the have a very certain “rule” for their “”God” Astronaut Training Program” which they first called a “Human Individual Metamorphosis”. This person asking if there is a way to avoid the dark forces sounds to me like a ripe soul in that vehicle where many are overrippened and are already sold themselves to the Luciferians. As usual it’s not our job to save souls as religionists often do. It’s our job if we choose to take it to show the choices by introducing people to Ti and Do and their Next Level Above Human so they can judge for themselves who to give their allegience to. I’m not saying everything I said in this post is exactly as Ti and Do would have said it. In fact I am confident I didn’t. I would welcome anyone’s help to improve my post and make it their own or start from scrach to make their own using quotes from Ti and Do and Crew and references to documents they left behind. If you leave those quotes in comments on this blog post I’ll include them to make this post better. Open minded? How open are you really? The winner gets a free Luna-tic-on the Moon award! 3) Space aliens – do they exist and if so how could they get here and if so why would they be here and what is the abuction phenomena all about and why do some of the autopsy’s reported/leaked show no organ systems or atrophied reproductive organ systems. 4) Government coverups, “wag the dog” or conspiracies. (e.g.the reasons for the war in iraq, the billions missing from the pentagon budget right before the financial meltdown, building 7’s collapse, the curving bullet, osama bin laden’s quick burial at sea to support his islamic beliefs of a quick burial, the entire wtc attack scenerios, what is behind the global financial meltdown, etc. 5) the now dozens of un-explainable observations in space that are all assigned “camera glitch” or stock pseudo explanations of. (e.g. comet ison did survive it’s sundive, the object photographed by Japanese Space Observatory with Hale Bopp Comet, the object photographed with “pan starrs comet”, the mercury sunflare uncloaking of some type of man made looking object, the tiny planet with larger objects in orbit of the tiny one, the comet that lost it’s tail, the comet with no coma, hale bopp with three tails and a double nucleus scientists still regularly meet about to find answers as the nucleus objects are in orbit around one another. 6) Comet Siding Spring’s alleged dive into Mars and that large object below it that showed a reflexion of light off it in the direction of mars. 7) Are there space satelittes with all these cameras and if so why let the public see them. 8) underground base building for the elite to have a place to run and hide – is it happening or not? 9) Human or equivalent beings elsewhere in the universe? 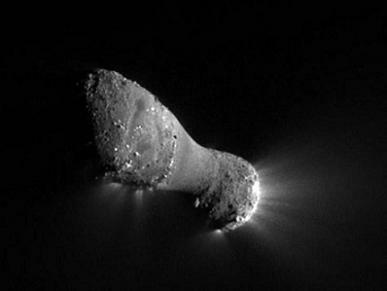 10) What is a comet? For over 100 years they were described as “dirty snowballs”. Can we believe the pictures taken from Deep Space probes that show them to look like powered machines with a rocky casing. 11) Is there a legitimate science called metaphysics that has to do with organized electromagnetic properties operating against various biological frameworks? 12) Whose side do you take between Einstein and Boehm on whether the eye is not only a receiver but a transmitter? Substantiate your answer with some evidence logical or otherwise. 13) Do thoughts exist in a measurable waveform? Is it possible that humans can pick up other’s thoughts? 14) Are the organs of a body and the organs of the gnome inside each cell evidence of intelligent design of biological organisms. 15) Are computers evidence of intelligent design? 16) Are descriptions in the Bible records and other records of “cloud of light”, “whirlwind of fire”, “chariots of fire”, flying humanoids as in the case with Jesus’ levitation above the sea and into the clouds both after his exit of the tomb, evidence of high technological transportation systems or just figments one’s imagination. I don’t care if you post this as I know you don’t like what I say, but I did want to comment on your Nephilim post (link posted below) but comments were turned off, so I’ll state what I wanted to offer here. Like Bpearthwatch and others the “Antichrist” is expected to return BEFORE Jesus returns. I don’t disagree with that, though I believe your missing that Jesus return was in two phases, incarnate as a “son of man” (offspring human) for the first fruit, his small group of disciples his Father gave him and the second not incarnate but to be witnessed in the sky/atmosphere/near space and potentially on the surface (but not incarnate) for the second fruit, those perhaps as many as 144 to 144,000 “saved” for future lesson time after recycling. Pale is only a remote translation for the Greek “chloros” which is green. Pale it seems came from the idea of a plant that is a yellowish new shoot which can also be the case as a descriptor of the physical body(s) these two take, I suspect there will be many ways “green” describes these two. Remember green was the original way in which we thought of space aliens – green Martians, the moon was made of green cheese. Then there is “green” in terms of the “greens” politically, even the tea party, where tea is a plant and plants are “green” or yellow at first and then green once matured. Then there is green as from the emerald isle so there may be some Irish linkage. And green also has a military connotation as the camouflage of marines, thus some military aspect can be engaged, even martial law as some fear is down the road. And finally green in perhaps the biggest way that is a result of what many of the space aliens have said through contactees and channelers that is becoming the battle cry all over the world and congress is meeting about as we speak, the environmental green movement that is claiming humans are bringing about the global warming trend. It’s no mystery that when they had the Nobel peace prize given to Obama in Oslo a number of years ago it was at the same time as a big environmental conference. Those conferences never get anywhere because that’s not what they are really for but it is a way for countries to come together to talk about the NWO and at some of the deepest levels interchange data on the space aliens involvements. Yes, the space aliens are who are “riding” the Red, Black and Pale/Green horses (humans) via both their discarnate presence as all the original fallen angels I believe are dead so are in the discarnate world manipulating whatever humans can bring them the biggest bang for their agenda, while are also running the show of the space aliens, their immediate descendants by whatever reproductive methods..When I was researching Romney with his LDS leadership and space alien affiliations in their more secretive beliefs, he really seemed to fit for a number of reasons but I know there are many who can fit that role. So of course we won’t have more of a handle on this thinking being true until about 2017 which I suspect will being the 4th stage in the birthing of Souls into Next Level membership because those that by then begin to wake up to the fact that Ti and Do were the incarnate return will be targeted and those who are public about their faith and spreading Ti and Do’s information will be apprehended and probably killed because of how such threatens so many in places of comfort and power in their beliefs. There is a lot more on this and I have been given the keys to opening up all the scriptures eventually though I can only do so a little at a time. I actually don’t want you to post this as I’m realizing that for most of your followers it’s too much too fast to consider what I have to share. You know well how hard it was for you to grasp the reality to the way scriptures and space aliens intermingle. Most people can’t fathom much about space alien realities let alone thinking that the Kingdom of God/Heaven physical bodies they wear also look like what some space aliens have been programmed by the lower forces to look like. For instance the grays of Whitley Strieber are horrendous looking as with other contactee and abductee depictions. I’m not saying there are not space aliens that look like that but I believe they are suits to disguise what they really look like as they are probably reptilian looking and are influenced in their suit design to resemble Next Level vehicles as the Luciferians know what those vehicles look like. Ti had one drawn and I put it on my broadcasts that I put on my YouTube channel 3spm if you want to see it. They look kind and loving and gentle and have slightly larger than human heads and slightly larger eyes but other than that are very pleasant-looking and are humanoid like the Lord said they created humans in their likeness which was a visual likeness in the Hebrew. This 2 hour broadcast covers Rev 11 Two Witnesses, bringing brand NEW translation/interpretations to most of the chapters verses that show how we are currently in the period of the 7th Angel’s sounding (trumpet). Also talk of Comets as Signs from Kingdom of Gods from the literal heavens with comet ISON’s proposed trajectory over the Ohio valley in line with the large array of fireball sightings in March of 2013. February of 2013 was 40 years (one hour Next Level time) from when Ti and Do were in Bourne, Texas. This was the “3rd woe” I believe that consisted of the Feb 15 meteor over Russia that did a lot of damage. See Wikipedia – search on Russian meteor for lots of good data. That was followed by fireballs and/or meteors over japan, Indonesia, Australia, New Zealand, England and California. That was followed by the near miss asteroid like a shot over the bow of the earth that prompted U.S. congressional talks about how to deal with asteroids. That was followed by March 10-20 by the Pan Starrs comet that I saw a photograph posted by NASA to have a companion object in it’s coma. That was in front of it’s path close to it’s head. Hardly a piece breaking off. And this was the anniversary of Hale Bopp’s with it’s photographed pic of the companion object. That was followed all done by April 2013 by fireball and/or meteors sightings from Vermont to Florida with the biggest density along the Ohio basin down to the Virginias – the belly of the beast which is the area where bpearthwatch claims ISON will fly over with it’s huge trail of largish objects which seems to be defying the calculated timing. Also talk about UFO’s crashes and release of the Luciferian space alien fallen angels in Rev 9:1 from their underground prisons in the 1940’s – 1950’s. This broadcast mostly covered Revelations chapter 6, what has been referred to as the four horses of the Apocalypse. Scripture indicates in this context these 4 horses are actually depicting humans, as to the Next Level a human is like a horse. This context is explained in Zechariah. Marshall Applewhite was the name of the White Horse, having as prophesied: Rev 1:14 His head and his hairs were white like wool, as white as snow; and his eyes were as a flame of fire; This “vehicle” (body) was “sit upon” – taken over for His task by the same Soul who last had a physical vehicle named “Jesus”. Jesus said the eye is the lamp of the eye. An lamp gives off light, thus through his eyes others can come to see. G.W. Bush was the “horse”. A discarnate luciferian space alien inhabited him and used him as a figurehead to stimulate “endless war”. Then Obama, as the black horse is also influenced by a discarnate Luciferian space alien to help steer the two beasts of the republicans and democrats with his focus while in office being financial. He inherited financial crisis and wall street people became his closest advisers. Talk about the astronomical references to Rev 12:1 where the “woman clothed Sun” where sun = a ray of light and Sun representing the Father is saying that this individual is that “light ray” that chooses to wrap around her “light body”, the actual Soul that came from the Next Level by discarding their existing physical body in a “ufo crash”, the body of a human woman (as there are no male or female members of the Next Level, and all these revelations have literal application to the end times we are certainly engaged within). The use of “clothing” is rooted in what we wrap around our body and there are many references to “making our clothing pure, related to light and related to white (though as a race are certainly not pure but are actually anything but as purity is not based on skin pigment but IS based on behavior and ways). For instance “cleaning our robe”, putting on white raiment, etc. as to the Next Level a physical body is LIKE clothing in that if it’s removed They are NOT dead, while in the human kingdom they are dead – (discarnate) and still exist as a spirit to eventually be recycled at the garden’s recycling time, while if that human bonded with a Next Level incarnate representative while they were incarnate or soon afterwards then when they die their “soul body” however tiny and even seed like in it’s development is “saved” so is literally taken to a Next Level “heaven” a literal location in a Next Level dwelling (one of the levels in enoch’s described seven heavens). And the moon, in the next few words is the “body” that absorbs and reflects that “ray of light” to the Earth that serves as this Womans footstool, the way students can reach “her” (the Father) through as Jesus served and as Do served as. Also spoke some on the next few verses in Rev 12 pertaining to the mistaken translation of “crown” from two distinctly different greek words and contexts, one referring to the dropout dragon’s fallen angels versus those who were slated to receive their royalty as kings having conquered the human kingdom which was depicted to be on this “woman’s” mind (head) for the task on earth. Also talk about the adam and eve story with some new perspectives of how and why that took place. Covered lots of info about Ti and Do not covered before, but with some repetition and towards the end spoke about the debunking of the vague video inference to Ti and Do being hybrids from fallen angels. In the last 15 minutes re-translated and re-interpreted Rev 11:7-9 talking about how They are “overcome” is not the best descriptor. To subdue was more what happened and that is a completely viable translation option. And they later “separate from/by (earthy) death” as in “exit their human containers” when they have completed all they had to say with is not necessarily when their 1260 days of prophecy was completed as there are two words used. “Prophecy” and “witness”, where witness is also “record” or reporting to the judge. Then spoke of how their “dead bodies” was greek ptoma = “ruin or failed” not dead or body at all so that it matches with “subdued” and get rid of the extra words translators added, “shall lie” as they did have to lie at all. Street is a wide plate more like a public square but if it’s for people of kindreds and nations and tongues and nations that has to be a “melting pot” area that is covered by the media to accomplish which fits what happend in the US to Ti and Do. This area is likened to “spiritual” (non-physical) Sodom, and/also Egypt and Jerusalem so is NOT those places where this occurs. The public sees their ruin for a small period of time and it seems to indicate 7 years as there was 7 years from 1975 for the first media to 1982 with the TV Movie “Mysterious Two” though I may still have that wrong. The following is my DEBUNKING the claim that Ti and Do are hybrids created by the “fallen angels”. This person below, Daisy was simply mirroring another’s youtube video that she thought made this claim. It’s not a direct claim but see for yourselves as the video link does have some interesting things but is geared to attack the new agers which I don’t really find much fault with except for how she is preaching Ti and Do are a part which couldn’t be further from the truth for those brave enough to see for themselves by studying the information Ti and Do left behind. Ti and Do are two hybrid humans that are the result of fallen angels minipulating the dna of abductees and creating clones and hybrid offspring. I have a video on my channel, http://youtu.be/cnLmrhrOcTI this video and this woman calls Ti and Do her hybrid children? I will look at the video but I happen to know it’s based on more Luciferian space alien fallen angel mis/dis-information that there will be no proof of. For you to believe this is your choice and I’m glad you have that choice – choosing sides is very important to the One True Kingdom of Above Human Beings aka God from the literal heavens. We each become our own judge in this regard though when each of us die, They then based on our choices sort our souls/spirits into the appropriate locations for future opportunities for a new “overcoming program” or to provide “fertilizer” for the new overcoming program OR to be recycled the fate of the existing ones who are referred to as Luciferian space aliens. (I don’t know if all space aliens fall into this last category). I will respond to the video later.? I watched the video and actually don’t have much to disagree about though see only tiny, tiny references that can be even remotely tied to Ti and Do. The abducted woman said she met her hyridized children and drew pictures of them and said their names were: Neo, and then two named Tia and Tio who were girl and boy and were holding hands and another Geo. If this was the reference, wow what a stretch that is. They have one name with the same first two letters, “Ti” and the other with the same last letter “o”. Also, when did this woman get implanted with the alien related seed. She looked young when she was videod. The human vehicles Ti and Do took (born again into flesh – latin carne where carnal comes from and thus an incarnation just like how Jesus was born into flesh) only ended up being named “Ti and Do” in 1977 having awakened in three stages that were completed by late 1973 when they were in Gold Beach, Oregon. (though they continued to receive instruction from Their “heavenly Father” – Ti’s Older Member not incarnate thereafter). By the way Jesus also evidenced two or three stages to his awakening. First as a young boy when he said he was “about his Father’s work” and next that propelled him to leave his life behind to go into the desert to fast and commune with his heavenly Father and deal with the Luciferian (probably discarnate) fallen angel space aliens, and then when it was witnessed as a “body lighting down like a dove upon his physical body when he came out of the water following John the Baptist’s administration of the representative “cleansing (overcoming) of his human body (world)”. Also, Do’s vehicle was 41 years old, and Ti 44 years old in 1973 so again an impossibility unless that woman’s testimony was shot at the latest in the 1940’s. Then there was a reference in the end to these light children bringing an accelerated evolution to earth. The author may have taken that idea from Ti and Do but if so it is totally misapplied as evolution in Ti and Do’s mind was related to a Soul being “born of spirit” as Jesus said required of his disciples that they are “born again of flesh”, not this silly idea of “born again” by claiming it as a title that many Christians have been brainwashed to believe because of the real misinformation campaign that has been going on since Paul of Tarsus was shot with a laser by ET’s, not anything the Kingdom of God would want to do or showed ANY evidence of doing to anyone else. All that stuff about Souls being implanted in humans that are pregnant is another juxtaposition of the way the Kingdom of God/Heaven was compared by Jesus to be like seed planters. However they don’t do that on spacecrafts. Earth is their working laboratory. They have no use for humans on board their “clouds of light” (cloaked craft) and “heaven” as the dwelling environment for Members of the Kingdom of God (angels, archangels, Older Members (Fathers (Father and Jesus)). It’s very telling that next to zero people are willing to actually understand what Ti and Do taught. They are much happier and secure to avoid them like the plague or make general or misleading statements so people can have an out from paying any attention to them. However it’s all in the Kingdom of God/Heaven’s plan to allow us all to CHOOSE. I know Ti and Do were considered New Age but that is a Luciferian space alien fallen angel plot to tie them to what is todays anti Kingdom of God/Heaven agenda as was also done with the stimulation of so called suicides of jim jones group and solar temple which were wrought with murder and manipulation and children and human behaviors unlike Ti and Do’s behavior and ways that were the complete opposite in hundreds of ways? This video actually is a good overview of a great deal of the kinds of things the space aliens have been engaged. What Christians don’t often have a clue about is that just like the New Agers have largely been comondeered into the space alien camp whether they know it or not, so have all religionists and agnostics atheists and actually all of us to degrees according to our behavior, ways, beliefs and non-beliefs that are not directly related to Next Level behaviors and ways and truth about Their physical non-spiritual realities. Now I can understand how the maker of this video you referenced lumps Ti and Do into the same space alien mix. To the uninformed eye they look similar. Both bodies of information speak of living physical beings from outer space, both speak of their having physical spacecrafts for transportation and both have a program that involves genetic development of the human species (except with the space aliens the Kingdom of God/Heaven would not consider “development” accept as it develops the illusion that they are “god” simply because the originators of the space alien agenda, the “fallen angels” had very elementary jobs for the Kingdom of God/Heaven which is what qualified them as the Genesis chapter 6 “sons of god”. (Being a “son” simply means they had grown to some degree of service to the Kingdom of God/Heaven. A watcher task is an elementary task for the Kingdom of God/Heaven given to some who are coming up to test their resolve and to see if they can be trusted before assigning them a Kingdom of God/Heaven “incorruptible body”. Thus this latest earth civilization starting with Adam and Eve and the presence of the “luciferian fallen angel space aliens” was subjecting some of those to the test of dealing with the influnence from the Luciferians to see if they too would fall as the Luciferians and the third of that classroom body did. Additionally, the fact that a Kingdom of God/Heaven physical body that Ti and Do described is a white body with an ever so slightly larger cranium but without big bug like eyes nor claw hands nor grotesque or insect like appendages. Humans were created in Their image – that’ s primarily that they look the same – humanoid that jesus demonstrated after the tomb and were the way the beings outside the tomb looked and when Jesus ascended into that cloaked (clouded) spacecraft. They were mistaken for humans just like in the Lot experience as well. The Luciferian space alien fallen angels know how the Kingdom of God/Heaven grows the garden so they set up facsimile events and teachings that they actually believe themselves as they had the Mind they had once received from their “heavenly Father” removed from their consciousness because of their fall and subsequent war against the Kingdom of God/Heaven. Just had a couple questions is the rapture teaching a deception from the lower forces to abduct people in mass? This can seem absolutely crazy, but the entire civilization – what we all consider the norms are a mix of mammalian instincts and their desire for survival, Luciferian type “fallen angel” space aliens, now primarily in discarnate (spirit) form together with their human and human equivalent descendants, because of how they propagate their seed with mortal humans on Earth and how these very same descendants are currently influencing humans (and factions in military/government) on Earth to make choices that have a great deal to do with the “shadow governments” that are also behind many events that usually are later called conspiracies who are also mostly behind the UFO phenomena since the 1940’s and 1950’s to date. Some of the crashes of what to the Next Level would be primitive spacecrafts that the Next Level used to get their crew in the earth environment in an undercover way for the Two Witnesses (Ti and Do) led project of presenting a third trimester overcoming of humanness program to test those they were considering to have join their crews as members of the evolutionary Level Above Human, the old name being “Kingdom of God” (Above Human Beings (existing Ones) from the literal heavens). These all constitute the “Lower forces”, a phrase Ti and Do used as they were all of the evolutiouary level BELOW Their higher evolutionary level. And these “lower forces” are referred to as the “beasts” that also have their heirarchy with the ones called the Dragon referring to the actual “fallen angels”. These Fallen Angels when they propogated and then died, continued to “influence” those they propogated and whether or not any one space alien group know who their progenitors were is a case by case basis. But they all see what Ti and Do called the Kingdom of God/Heaven – Evolutionary Level above Human as simply an organization out to control humans, so they are being humanitarian to steal some away from belief in Ti and Do as they want a certain amount of new membership to replace those who die. Of course this process of trying to steal those humans who were prepared by the Next Level for growth in one of their trimesters towards “spirit/soul birth” has been going on from the start of the experiment with those called Adam and Eve who were not the first humans on Earth and were not necessarily the first such experiment on Earth. The temptation of Adam and Eve was one such attempt. There were many attempts in the Jehovah/Moses led experiential “classroom” and the obvious example of the way Paul of Tarsus was mesmerized into belief, a way to infiltrate who the Luciferians see as their enemy by making a double agent, though he didn’t know it, so that he would say some things that he got from Peter and other disciples of Jesus while at the same time mixing in his own mind and Jewish upbringing that ended up becoming the foundation of Christianity today as seldom are the core teachings of Jesus spoken about or considered as what can be expected in any return of those same “holy” Minds/Spirits. Thus in a sense you are correct. Rapture is another of the ways humans can be “caught” by the Luciferian lower forces when it’s proper application has to do with humans given the opportunity to join with an incarnate Older Member from the Next Level who in at least the 2nd and 3rd trimesters need to “separate” from their human families to literally be with and form a real personal relationship with that Older Member who will take them through the lessons they need for the stage they are at in this three trimester birthing program. This is the Next Level “catching away” (rapture) a human from their otherwise normal mammalian life, illustrated by Jesus saying to his disciples that he was going to make them “fishers of men(humans)”. Their human families don’t want to let go of those humans any more than a mother bear wants to lose her young (that is until they can fend for themselves and then they must fend in large part on their own). Many in human families cling to their offspring even after they have shown to have become adults. However, I doubt the space aliens want many humans on their spacecrafts with them and especially don’t want humans that don’t believe in space aliens or spirits in actuality as aside from theoretical belief as they would not be able to get them to cooperate with their agenda and would be an interference in their tasks. So they primarily seek out Souls as space aliens can not create “souls”. Souls are those humans who received a “deposit” from the Next Level, an actual “container or pocket” that is a frequency structured, thus like a firmware “chip” that provides for interface as a homing device and container that can receive and store “mind” (information) only relative to future Next Level membership according to the “grade in school” of that human according to the Older Members and Crew determination. So I don’t think we will ever see a physical rapture event like is portrayed by populist christians though humans are abducted by these space aliens to be used for experimentation on their hybridization efforts to produce new “vehicles” they can then “inhabit” (influence) and/or to groom a few to be “ambassadors” to other humans on the ground. They are who are behind the cattle mutilations that occurred in a rash in the mid 1970’s which suspiciously looks like it was an attempt to link such with Ti (Peep) and Do’s (Bo’s) forming group then though just like humans use animals to experiment the Luciferians use humans and animals as well and even help humans to proceed with the same kind of research, thus the various cloning programs that false prophet Rael and company are deeply engaged from his experience when abducted to become a contactee. At the same time there is a growing concern that governments will be creating events that will require marshal law and necessitate putting people in FEME run internment camps like what Hitler and company did to dissidents and Jews in the 1930’s and 1940’s. This may become a reality and especially because of the very real programs that are underway and have been underway for decades to build underground facilities to use in case of any disaster. There are all sorts of ways this could go. As far as numbering “codes”, I think they are like you said, when related to the bible, etc. distractions from what is taught. However Ti and Do did say that one form of humor in the Next Level is playing with humans in a harmless way by at times doing things in ways that can show correlations to the past and thus future BUT even with minor observation of some of the patterns, as patterns are throughout the garden’s design, it won’t bring anyone any closer to Next Level Membership UNLESS it leads them to “plain” talk as Ti and Do illustrated big time. So I don’t know about 11:11 or 5:55 50 or 57’s though certainly there is a lot embedded to do with a seven and a twelve and a two and various multiples with times and dates and numbers of their crew.